What makes Geir Jenssen's brand of spacemusic, techno and environmental ambience special is that beneath the brilliant sound design and chilly surfaces is a humanity that's intimate, reflective and sometimes deeply touching in its melancholy. Sometimes ambient music communicates a visceral sense of place, a deep reflection of the environment in which the composer either lives or grew up in. Much is made of the fact that the home of composer Geir Jenssen aka Biosphere is the barren but beautiful world north of the Arctic Circle, specifically the town of Tromso in Norway. A fair point, too, because this environment has informed much - though not all - of his Biosphere music profoundly. But what makes Jenssen's brand of spacemusic, techno and environmental ambience special is that beneath the brilliant sound design and chilly surfaces is a humanity that's intimate, reflective and sometimes deeply touching in its melancholy. Jenssen at first played in a local medieval/world music ensemble call Bel Canto in the late 1980's, recording two albums with the group before leaving to strike out on his own in a more techno-influence direction. First he released several beaty acid house/techno recordings under the name Bleep but soon moved away from this uptempo and fairly derivative path. In 1991 came his first recording as Biosphere, a fully-formed ambient debut that announced one of ambient techno's earliest, most talented and distinctive voices. Microgravity (1991) remains an eerie ambient techno masterpiece. Jenssen achieves a striking fusion of glacial synth colourings, bleepy signals and static beats with sampled voices (that reference astronomy) and environmental sounds from the planet's freezing north. 4/4 dancefloor tempos like "Baby Interphase" and "Tranquilizer" are still there but are restrained to the point where they become a completely natural part of the album's ambience rather than sounding like attempts to please the demands of clubland. Patashnik (1994) is structurally similar but a little more refined. Its classic Biosphere: icy, melancholy strings and organ, darkish drones, crackling radio transmissions, looped melodic fragments and bursts of percussive Detroit-flavoured techno. Crucial to the emotional tone of many tracks is his choice of spoken voice samples, which tip the pendulum towards either a sense of of unease (the creepy kids on "Phantasm") or a sense of awe (the discussion about outer space on "Startoucher"). The examples of pure ambient spacemusic like "Mir" are different from that of nearly every other composer making music in that style, possessed of a distinctive shadow that makes them immediately recognisable. As on Microgravity, the sinister cosmic undercurrent of Patashnik is kept in check by its strange intimacy. On the closing track Jenssen allows the sunlight to poke through with muted, luminous guitar strumming and wisps of synthetic strings, a beautiful piece worthy of Popol Vuh. With virtually no beats, Substrata (1997) is in a different league, a stunning work of deep ambience and one the great electronic ambient albums of the 20th century. 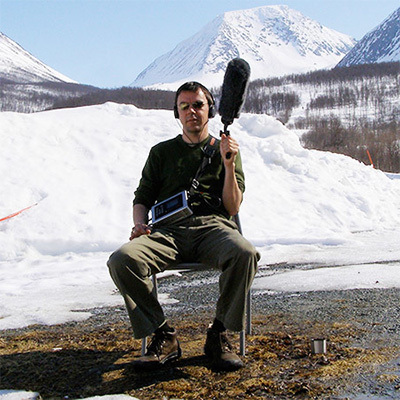 The environmental samples and outdoor field recordings of previous albums are sparser and less layered, which leaves space for Jenssen to expand the sound stage even further. The result is music with a remarkable landscape depth and feel. Substrata's compelling abstract moments sit next to what is tonally some of Biosphere's richest music. The piano phases and billowing strings of the lovely "Poa Alpina" sounds like Budd & Eno relocated to a massive glacier set under a brilliant blue sky. "Chukhung" is two very simple loops - a strummed electric guitar and a short synth phrase - but Jenssen plays with perspective and depth of field to make it appear that the piece is constantly changing. "The Things I Tell You" again mixes simple elements: a gently ominous drone, a squelchy analogue synth progression, and a sci-fi pulse swooping around and overhead in and out of the mix. The album's most famous piece "Kobresia" has a pristine beauty to take the breath away: its lonely yet lovely, its sighing melody as soft as a feather and as pure as an alpine lake. Although bearing similarities to Biosphere's early 90's output, the absorbing Cirque (2000) suggests further changes and it revels in new sounds, low-fi environmental samples and beats with oddly muted edges. Tracks range from totally abstract looping exercises like "When I Leave" and "Moistened & Dried" to atmospheric drum'n'bass with the frantic beats muted and softened to tickle you ears rather than move your feet. Cirque is based on the infamous and fatal Alaskan wilderness trek of American amateur explorer Chris McLandless and the sense of loneliness and isolation is palpable at times. The album does end on a positive note with pulsing reverse chord effects that create a lovely enveloping warmth, perhaps an acknowledgement that even the most patient listener doesn't want to be left out in the cold for too long. The remainder of Biosphere's discography is non-essential without any outright duds. The beatless and uncompromising Shenzhou (2002), for example, uses digital loops to construct a stark, repetitive minimalism that draws partly on the short repetitions of American classical minimalism. Imagine the sound of a stuck CD and you begin to get the picture; it's none too approachable but may be of interest to glitch electronica fans. Similar minimalist ideas inform the jazzy drum loops of Dropsonde (2005), an interesting change of direction but lacking any real emotional undertow. N-plants (2011) is surprisingly smooth electronica but adds nothing significant to his legacy. Over his career Jenssen has also released several albums taken from film and expo soundtracks which, taken out of their original context, simply don't scale the same heights of his best work. Several of Jenssen's 90's collaborations rank alongside his best solo work. The dark-ish ambient tech-trance excursion The Fires Of Ork (1993) is an inspired pairing with Fax Records boss and ambient guru Pete Namlook. Birmingham Frequencies (1999) is the best of Jenssen's two live concert recordings with UK composer Bobby Bird aka Higher Intelligence Agency. It's an effective translation of the Biosphere sound into an urban environment, coloured with samples recorded around the British city and occasional exotic touches like the ringing gamelan drum sounds on "Gas Street Basin". Finally, a word on listening to Biosphere albums. Despite the subtlety and general restraint, Jenssen's image-rich music for some reason doesn't make for good background listening, in the same way that you wouldn't walk through an art gallery without actually stopping and taking in the pictures. Play his albums at reasonable volume and give them your attention - or they may bypass you altogether.